In the spirit of going back in time, let's go back a few weeks to the holidays (or really, it could be going forward in time to your next potluck), as I have a few recipes to share that are great for potlucks of all sorts. I will shamelessly admit that I like to bring the dish that everyone wants the recipe for. I like cooking, I try to make food that's appealing, so I score it as a win every time someone genuinely likes my food enough to want to know how to make it themselves. And I always share the recipe. But with that said, there are varying types of potlucks and varying types of audiences. Except for the smoked salmon tart, which is probably best at a potluck where you KNOW at least a couple of people like smoked salmon, I do think most of these dishes will work for most potlucks, and while we all love baked brie and nacho dip, somebody else always brings those things. So here are a few alternatives to spice things up and broaden the potluck horizons. Without fail, one of the recipes I get asked for most often is this buffalo chicken dip. It's not pretty, so I didn't take a photo of my own, though I have shamelessly stolen the one below from the Frank's website (because it's also not my recipe - it's theirs). This dip is creamy, spicy and filling. People just gobble it up. It's also completely and utterly terrible for you, so eat sparingly. 2 cups chopped/shredded cooked chicken. 2. Combine all ingredients in a 1-quart baking dish. 3. Bake 20 min. or until mixture is heated through; stir. Serve with crackers or vegetables. (I like it with tortilla chips). 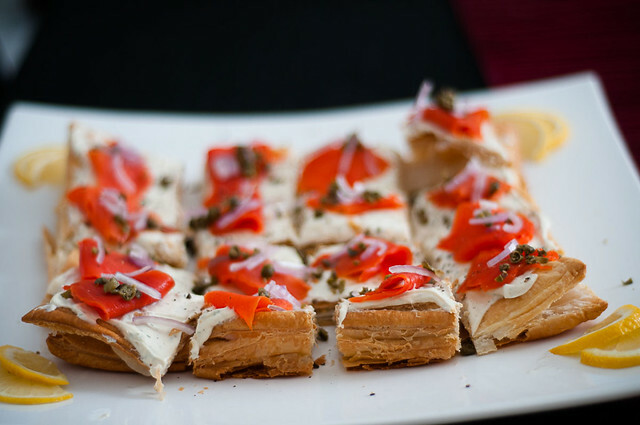 To continue in the appetizer vein, a favourite thing for me to make is this smoked salmon tart. It looks beautiful and fancy, and the best part is that the actual labour involved is relatively low. It's not fussy to make. 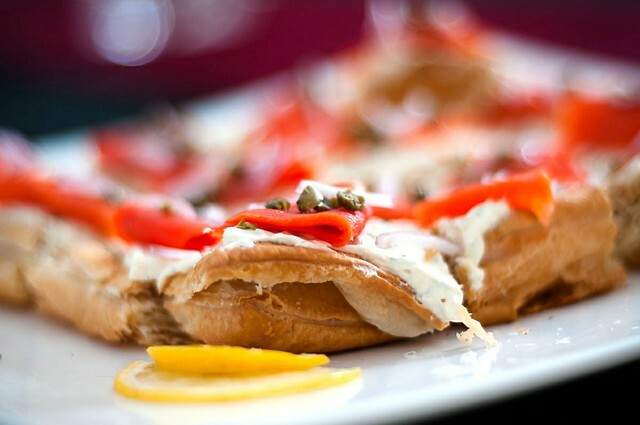 This is ALWAYS a hit with the smoked salmon lovers, and always avoided by everybody else. But that's okay, because it means more delicious smoked salmon for me. 2. 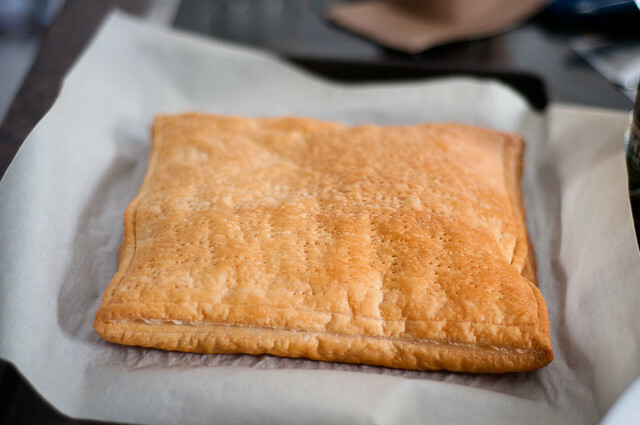 Let puff pastry cool, and in the meantime, combine the sour cream, cream cheese, mustard, dill, garlic and a bit of salt and pepper. Once the pastry is cool, spread the cream cheese/sour cream mixture. 3. In terms of presentation, I find it easiest to slice the tart at this point (on a cutting board because it makes a big crumby mess) and carefully transfer the pieces to your serving platter. I think it slices best into 16 pieces, but you could go smaller (25 pieces) or bigger (9 pieces) depending on the size of your group and how much they like smoked salmon. 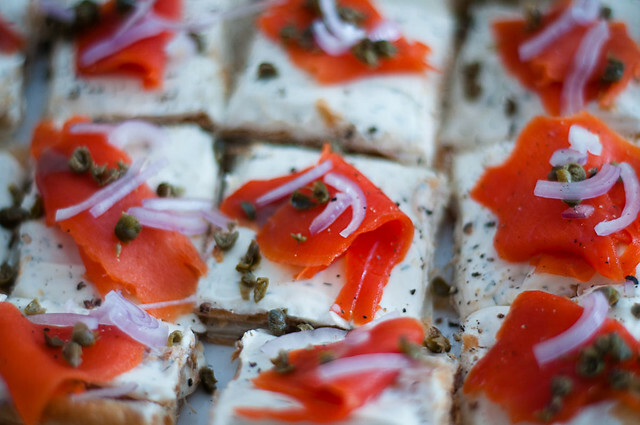 Top each slice with a piece of smoked salmon and decorate with slices of shallot, capers and fresh cracked pepper. Adorn the platter with lemon slices. Done. And doesn't it look pretty? My last couple of recipes to share are salads - these recipes are both big crowd pleasers and hold well for a day or two - they are great for picnics or barbecue type potlucks. So that's why you should make it. 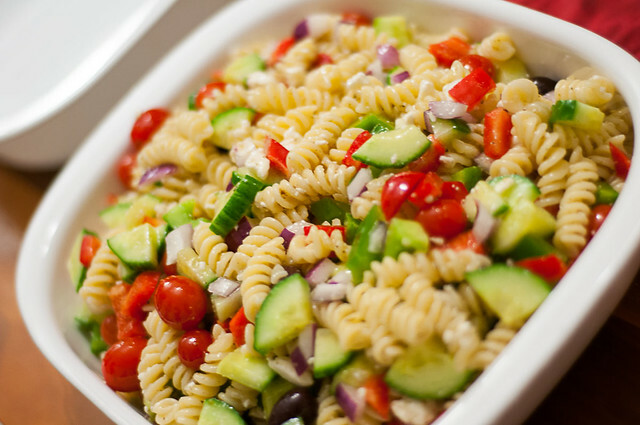 Last thing I'm sharing is a VERY simple recipe for greek pasta salad - I love this one because it's ever so slightly outside the yucky mayo pasta salad box, and pretty much everyone will try it and enjoy it. 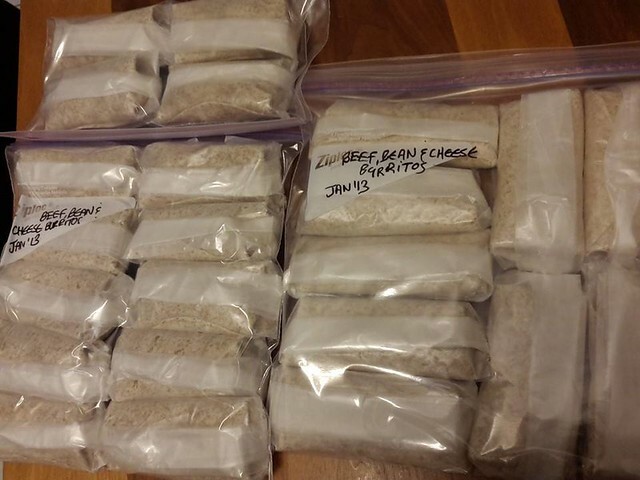 This comes together really quickly and makes a good-sized batch, so it's great for a crowd. I usually just purchase greek salad dressing (I love Farm Boy's), but you could use your personal favourite greek dressing recipe as well (I love the FB one because the ingredient list is so short that it's pretty much the same as homemade!). 1. Cook pasta according to instructions for al dente. When the pasta is cooked, rinse it repeatedly in cold water until it is cool and the sticky starch is gone. 2. Chop the peppers, cucumber and onion to bite-sized pieces. 3. Combine the cooled pasta with the chopped vegetables, tomatoes, olives, feta and salad dressing. And you're done. It's that easy. Amounts on this are very forgiving - if you have more or less of a given ingredient, it will still be great (case in point, I was SUPER short on olives for this batch and it was still a hit!). Anyway, I know this wasn't the most focused post, but hopefully you've got a few ideas now for potlucks (or even just lunches, because these salads are EPIC).